We sit outside with friends or family and look back our houses. Looking a bit tired, we think… Well, it’s the right time of the year for improvements. Some of us will think ‘lets do it ourselves’, well probably not the best idea, unless you have tons of time at your hands and endless resources of patience. It’s best to leave it to professionals I would suggest. No one knows better than decorator who does it day after day. How to correctly prepare the surfaces, what materials to use and most importantly, how to get it all done safely and get the result that will last for many years to come. Exterior painting prices could not be more different. All the work goes into preparation, which will not be seen once it’s been painted. So to cut the long story short, the better condition of your house is, the less it will cost to get decorated. 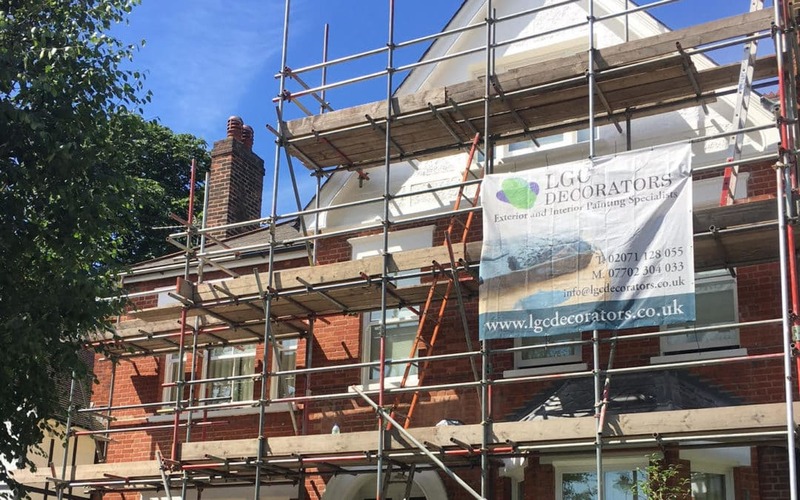 To repaint the simple terrace house could cost as little as £500, but if you live in larger property, then scaffolding might be required and then the cost will definitely be a lot higher… The same is said about the condition of existing paintwork. If it has not been done for 20 years, then you could expect unexpected. The best would be to get in touch with your local decorating company and get some quotes in. Plan your budget and don’t forget that good services and good materials come at the cost. Summers are always the best, but as long as the weather is dry and temperatures are above 12c, then it’s good to paint. So plan in advance and you will not regret waiting for the right weather. Choosing the right materials is crucial, so ask your decorator what would suit best for your house. If you live on the coats then using normal exterior paints might not be smart thing to do. Seaside climate is different to the one in land,so choose smart and don’t forget the material cost is only a fraction to what you will spend on scaffolding and labour. LGC could recommend choosing Leading brands like Farrow and Ball, Zinsser or Sadolin. Don’t just go with the flow. You will save loads of money at the end, by not having to redecorate too often. Move House or Stay and Improve it? Now, that we live in interesting times, with our politics going beyond common sense sometimes and uncertainty is definitely the factor. This is why we should invest in our houses rather than try and sell them. No one knows where we will end up in couple of years time, but for now lets stick to making our lives more beautiful. And what is the best way, to do it? Of course, make your home like new again with the help from LGC Decorators.